If you own a small, rapidly-growing businesses it may sound like a dream come true—but it doesn’t come without its fair share of nightmares along the way! Such companies rapidly outgrow their business processes and this creates headaches in all areas of the day-to-day running of the business. Often, they muddle along with inefficient processes, poor communication, and frequent costly errors that harm relationships with customers. Ultimately, service delivery problems lead to customers leaving and the nightmares beginning for the business owner. But turning this round is often simply a case of re-defining the sales processes and introducing more automation to improve the service delivery for clients. Salesforce is one of the best tools for achieving this. An excellent example of how Salesforce can help in this scenario came to light recently with a company we provided a QuickStart for in Birmingham, AL. Steel City Pops was founded only five years ago. 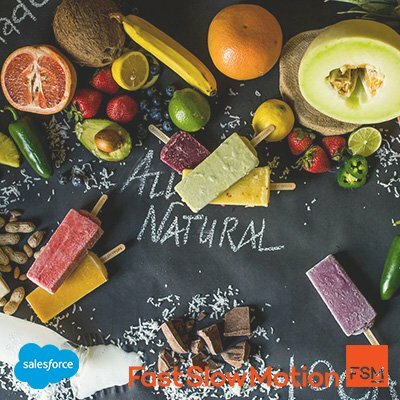 The company makes delicious, gourmet pops using locally-sourced natural ingredients that contain none of the bad stuff, like refined sugars or high fructose corn syrup. Fortunately, the idea caught on rapidly. The company has expanded quickly—and they now have 21 locations across the South. Customers can purchase their pops directly from the outlets or they can be catered at special events. The catering side of the business has been particularly successful. Using the power and flexibility of the Salesforce platform, we helped the business to scale with an enhanced way for customers to schedule events and place orders. Customers can now go online and fill out a form that is driven by Formstack and connected to Salesforce. All information is sent from Formstack to Salesforce seamlessly as soon as the form is submitted, which allows the Steel City Pops team to immediately get orders moving. There is also a more automated event management process that all staff understand from beginning to end—including new employees; and a more comprehensive and accurate overview of the business as a whole. So, in a nutshell, orders are now received and processed quickly and accurately, and visibility, customer communication, and employee training have all improved. A customized, consistent, repeatable, and automated process is now in place. …so that the nightmare ends… and the dream continues! Talk to us now if you are experiencing the type of problems described in this post. Schedule a call with us here.